Tomorrow there will be lots of happy children after they open their gifts and see their long-awaited present. There will also be disappointment in the faces of those who won’t receive what they have hoped. The Christmas season can be a time of celebration for some, but also a time of sadness and disappointment for others. People respond in so many ways to this season. Christians try their best to keep Christ in the celebration. For some, they could care less whether you celebrate Christmas or not. Every year some Christians try their best to honor Jesus with their celebration of Christmas; at least to remember why they celebrate this holiday. Some have forgotten what Christmas is all about. Christmas, it is the story when God became a man to redeem mankind. It should always remind us how gracious God has been to us. It should remind you that we are extremely favored; valued by majesty. The day Jesus was born, was an ordinary day for the people of Judea; everyone went to their own business. There were lots of people in Bethlehem that day for a census was issued and everyone needed to go to their home town to register. Joseph and Mary had traveled from Nazareth to Bethlehem. They tried to find lodge, but it was impossible, there was no room for them in the inn. Jesus was born in a manger, not the best place for a baby to be born in. Shepherds were tending their flocks at night when an angel appeared to deliver good news. (v.10) Don’t be afraid, I bring you good news of great joy that will be for all the people. Today in the town of David a Savior has been born to you; he is Christ the Lord. The angel announced to the shepherds that their expected Messiah has been born. This is the reason to celebrate, the long awaited Messiah is here. Salvation has come to all. The angel told the shepherds where they can find him: (v.12) the baby wrapped in cloths and lying in a manger. This news was so great that heaven and earth combined in a great symphony. Glory to God in the highest and peace on earth among those with whom he is pleased. The angels announced the news and left. 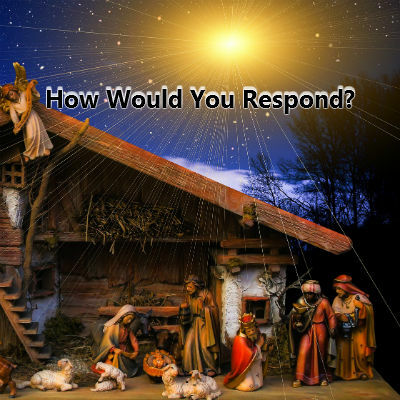 The shepherds must respond to what they heard. –They could have just ignored the message completely and do nothing about it. Or they could be move to do something about it. – The shepherds chose to go and check the veracity of the news. They heard the news announced to them by the angel, so now they decided to go see. The angel had given them a sign by which they would find the baby. The angel said that the birth of a Savior would bring joy to all people. This is the greatest news ever. God gave mankind his greatest gift, the Messiah who was born two thousand years ago. Jesus became the Savior when he died for the sins of the world. As a baby he could not save anyone; he needed to be saved from danger by his parents. This news brings joy to those who believe in him as the expected Savior. To those who don’t believe, this news is terrifying. Jesus became the determining factor between life and death. God gave this gift to everyone because the gift of the Savior is for everyone. God wants to save the whole world and gave the gift by which everyone can be saved. However, not everyone likes this gift; not everyone sees the need for a Savior yet. Not everyone will be saved because they don’t receive the gift of God. Whosoever believes in him will not perish but have eternal life John 3:16. Jesus will save those who receive him and believe in him. Those who don’t receive God’s gift of Salvation will perish for all eternity. What are you going to do with Jesus? He is the gift God sent you; the one who will bring joy and peace to your life. How would you respond to what God has done for you? How do you respond when someone give you a gift? – The gift is nicely wrapped, beautiful, appealing to the eye. But it won’t benefit you until you unwrap it and see what it is and embrace it. You can believe Jesus is the greatest gift God sent for us; you can sing about him, preach about him, do things on his behalf, but it won’t help you unless you receive him; you must unwrap him and partake of him. God so loved you that he gave you a gift; have you truly received him yet?